All lodging available seven days a week. PIONEER COTTAGE: Restored Pioneer Cottage (picture left) has a more rustic atmosphere and includes a large parlor, equipped kitchen, screened-in porch, three bedrooms with a total of five double and twin beds, a full bath and half bath. Pioneer was literally the first structure built in Rugby in 1880. 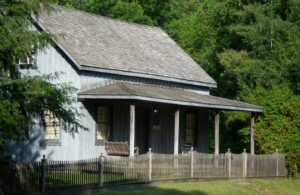 Founder Thomas Hughes stayed here on his first visit to the new colony as did many other settlers in early years. Its hand-planed poplar walls could tell many tales if they could speak. Pioneer will accommodate up to 8 people. TV w/DVD Player for movie viewing only. All lodging facilities are within a two-block area in the National Register Historic District. The Harrow Road Cafe is in the center of town. Please check the link for current hours. 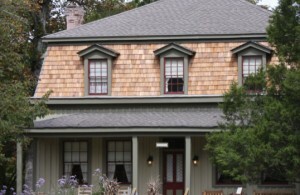 Historic Rugby is an ideal location for group lodging, for retreats, seminars, reunions, etc., for up to 30. Rate discounts may be available depending upon facilities used and length of stay. Meeting rooms, custom menus, reduced tour rates, and entertainment arrangements are available for groups. 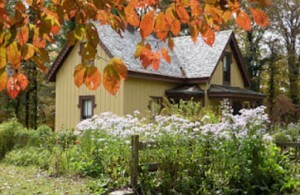 Additional lodging in privately owned facilities can sometimes be arranged. When You Lodge At Historic Rugby You Help Restore and Preserve this Special Place!